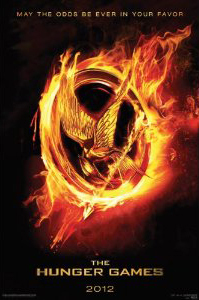 I’m afraid to say it, but The Hunger Games left me starved of intrigue and commitment. Jumping on the Lord of the Rings > Harry Potter > Twilight bandwagon, the film is based off a series of popular books (that I hadn’t heard of until the film arrived) and follows a young girl sent into an arena of death against other children for the entertainment of a tyrannical, self-obsessed higher society. Sounds pretty grim right? Unfortunately The Hunger Games feels terribly insecure, lacking self confidence in what it can and cannot show to a 12A / PG-13 audience, and decides to meander around and waste excessive amounts of time. This is not the worst crime however, since it was expected, the worst flaw with the film is its lack of confidence in explaining itself. The plot literally makes stuff up continuously, like a child improvising a story: “Oh, oh, now we have fireballs that appear out of nowhere! Now they make these huge monsters appear with magic! Now they get help from the outside cos they’re the main characters!” What the heck is any of this?? I didn’t understand how it was happening as none of it was explained, great plot-holes loomed constantly, and with a run time of two hours and twenty, you’d think they would get around to some exposition! The film also has some of the stupidest villains I’ve seen in a long time. We are talking 1980s cartoon villains. Not so much how they look, I dug that (even though The Fifth Element‘s designs by Jean-Paul Gaultier did it so much better) but how their entire society was hinged on a massive flaw i.e. The Hunger Games. Gladiatorial combat is no new concept, but it is particularly stupid when the dominant masters train up the helpless, angry majority. A majority prone to riots. Not just that, but thinking giving these poor people “hope” is a good idea? Hm, let’s see: hope + training + wilderness survival (thanks to being shunned and native to the wilderness) + hero worship via Hunger Games = bad, stupid, retarded idea. Not to mention our heroes in this story trump them at their own game in such a ridiculously easy fashion, means they are completely useless as antagonists! Anyway, I’ve gone on about the flaws… since there are a lot… The pros, well, I do like the concept (despite it being terribly implemented here) and the “Capitol” high society characters had some funny lines from time to time, and leading star Jennifer Lawrence was convincing as a young but strong female role model. I’m sorry, but The Hunger Games strikes me as a “for the fans” production, I was disorientated by the insane camera work in the fight scenes (it made Transformers and Batman Begins feel like cruise holidays) and disconnected by the shallow explanations.